This quote always makes me a bit sad. Deathwing sums up much of the story of the Black Dragonflight, and by the end of Dragon Soul, we seem to bring it to a close. Allow me to explain what I mean. Many of the bosses we fight can be grouped together. For example, we have Old Gods, Scourge, trolls, and Titan constructs. We also have the Black Dragonflight. Unlike some of the other that are grouped together by race or purpose, Nefarian, Onyxia, Sinestra, and Deathwing are family. In Vanilla, we kill Deathwing’s son and daughter, Nefarian and Onyxia. In the Burning Crusade, we see Sinestra, Deathwing’s prime consort and mother of Nefarian and Onyxia. 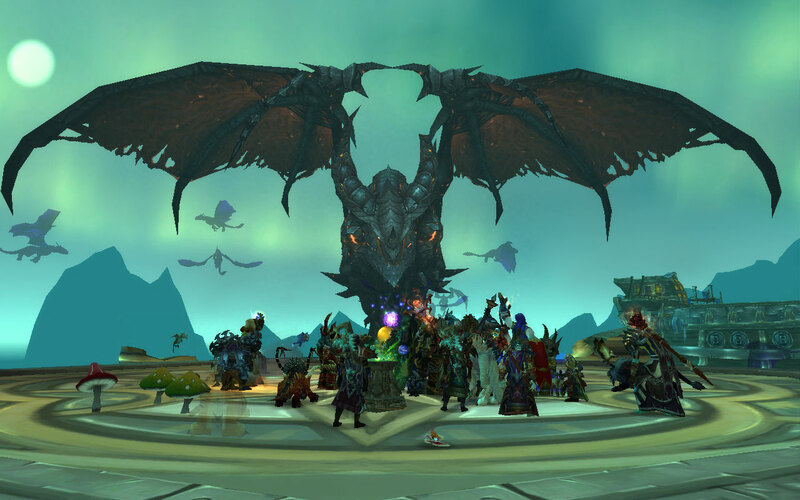 Wrath of the Lich King brings us Onyxia again. During Cataclysm, we kill Nefarian and Onyxia for good, we slay Sinestra, and we go on to kill Deathwing himself. It’s interesting having an entire family as bosses – a lineage of enemies for us to battle. It seems like that’s done now. On top of this, Deathwing himself doesn’t even seem to care that they were family (not that I’d expect him to care at this point). In fact, I think his mentioning of them in his monologue before the Ultraxion fight exemplifies this and is a nice detail reinforcing the fact that he’s insane and cares only about destruction. Deathwing calls Nefarian, Onyxia, and Sinestra nothing compared to his ultimate creation, Ultraxion. Never mind that they were his children and lover. Will we see more of the Black Dragonflight as enemies in the future? I suppose we could, but I doubt they’d serve any real link to Deathwing. New black dragons could become evil all on their own. (Update: I understand that there are uncorrupted black dragons. However, if they become bosses in the future, they will most likely be bosses for some other reason. The on-going problem of the Black Dragonflight has still been solved.) Then we have three new dragonflights that were created, either directly or indirectly, by the Black Dragonflight. First, there was the Chromatic Dragonflight – dragons that possessed the powers of all five flights. As far as I know, and I might be wrong because I didn’t play endgame in Vanilla, there’s only one known adult Chromatic Dragon. Chromatus has five heads, each a different color. While he was defeated, he’s not exactly dead. He planned on mating with a Blue Dragon to create natural Chromatic Dragons, and I believe Blizzard will definitely return to this in the future. Next, there’s the Netherwing Dragonflight, dragons that were exposed directly to the Twisting Nether and were, well, twisted by it. So far, they haven’t stirred up much trouble. They wanted to be left alone, and they eventually were able to do as they pleased thanks to player involvement in the Burning Crusade. We could definitely see more of them. And then there’s the Twilight Dragonflight, Netherwing eggs further twisted by the Black Dragonflight. We see them a bit in Wrath of the Lich King, first as drakes in the Obsidian Sanctum and then as Halion in the Ruby Sanctum. In Cataclysm we see them quite a bit more, culminating in the slaying of Ultraxion. Really, Blizzard could throw anything at us. There’s always a way for them to bring back anything they want – Black, Chromatic, Netherwing, or Twilight. In my opinion, we won’t see any trouble from the Black Dragonflight for a while. They’ve effectively been wiped out, although new Black Dragons could be born or less important ones could decide they’re mad and decide to fight us. The Netherwing have been rather neutral. Sure, they could get mad or turn evil if Blizzard decides to do that, but there isn’t any reason for it. Without a powerful Black Dragonflight, I don’t see a high chance of more Twilight or Chromatic Dragons being created. Of course, there’s still Chromatus. It’s very likely we’ll see him again. With the end of Cataclysm, we see the end of the line of Deathwing. It’s been fun.